Azalea EHR is a comprehensive electronic health solution that integrates several functions and tools in one platform. It combines medicine practice management tools and office features such as scheduling and billing. For those who are new to the technology or are looking to transition from a different EHR, they can rest assured that Azalea EHR is an uncomplicated and user-friendly software. With it, they are guaranteed a smooth experience and they can count on technical support during the switching process and afterwards. Azalea EHR ensures that everything a provider or non-provider needs is within easy reach. The application’s dashboard contains the features they need to control and streamline their work processes with scheduling, e-prescribing, charting, lab test ordering and results exchange, and more. 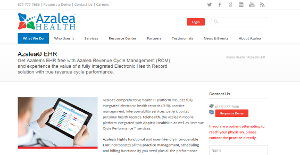 Furthermore, Azalea EHR integrates with Azalea Revenue Cycle Management to offer a complete electronic health services management platform. Azalea EHR provides physicians, non-providers, and medical institutions the tools they require for smooth operations of not just their clinics. The solution connects the front office and back office to enable smoother workflows between the two, increasing office productivity enabling them to receive payments at a faster rate. Azalea EHR is all in the cloud, providing users mobility and allowing them to access and alter records while they are making their medical home rounds or when they are outside their sphere of work. This ensures that records are always updated and accurate as this eliminates paperwork and manual inputting errors. In addition, providers and non-providers can get themselves up-to-date with patient and operation news while they are on the go. With Azalea EHR, users can capture patient engagement data while on the move using their devices. Individual users can execute functions such as SAOP documentation, order lab tests and receive them, and arrange follow-up visits from one screen. Furthermore, the application allows multiple users to edit a single chart at the simultaneously, saving them time as they will not have to wait for their turn on the documentation. Azalea EHR enables patients to be more engaged with their own healthcare. The solution provides a platform for this, wherein they can check their own health records, request physician visits and medication refills. Additionally, patients can interact with their doctors directly from the portal, eliminating the need to go through a directory or through a secretary. With Azalea EHR, medical practitioners and institutions can rest assured that they are able to keep up with industry standards. With the assistance of the application, they can monitor their status so that they remain in line with Medicare and Medicaid EHR Incentive Programs. This way, they stand to receive incentive payments while they improve their healthcare services. Azalea EHR serves as a platform for information sharing. This function allows a smooth flow of data between physicians, non-providers, and offices to ensure that they remain updated with patients’ statuses. If you are interested in Azalea EHR it could also be sensible to investigate other subcategories of Best EHR Software listed in our database of SaaS software reviews. Every organization has different requirements and needs an application that can be customized for their size, kind of workers and customers, and the specific industry they are in. For these reasons, no software can offer perfect features off-the-shelf. When you look for a software product, first be sure what you need it for. Read some Azalea EHR reviews and ask yourself do you desire basic functionality or do you require complex functionality? Are there any industry-specific functionalities that you are looking for? Get the answers to these questions to assist your search. There are multiple factors that you need to mull over and these include your finances, specific business needs, your company size, integration requirements etc. Take your time, check out a few free trials, and finally zero in on the platform that provides all that you require to enhance your organization efficiency and productivity. How Much Does Azalea EHR Cost? We realize that when you make a decision to buy EHR Software it’s important not only to see how experts evaluate it in their reviews, but also to find out if the real people and companies that buy it are actually satisfied with the product. That’s why we’ve created our behavior-based Customer Satisfaction Algorithm™ that gathers customer reviews, comments and Azalea EHR reviews across a wide range of social media sites. The data is then presented in an easy to digest form showing how many people had positive and negative experience with Azalea EHR. With that information at hand you should be equipped to make an informed buying decision that you won’t regret. What are Azalea EHR pricing details? What integrations are available for Azalea EHR? If you need more information about Azalea EHR or you simply have a question let us know what you need and we’ll forward your request directly to the vendor.